Some hotels, restaurants and airports are offering wireless Internet access -- at no charge -- in the battle to lure customers and deliver ROI. At first glance, it might not make sense for profit-making businesses to give away, rather than charge for, wireless Internet access. But a growing number of hotels and restaurants have found that it pays to offer free Wi-Fi Internet access. This perk attracts customers and provides a real bottom-line payback for a relatively small capital investment, according to free-Wi-Fi pioneers. Cities and community development organizations across the country have embraced free Wi-Fi to boost economic development and attract visitors to downtown areas. A handful of small airports in the shadow of large hubs offer free Wi-Fi to attract travelers. And Verizon Communications Inc. in New York offers Wi-Fi free of charge to its Internet service subscribers to distinguish itself from its cable-modem rivals. Operators of free Wi-Fi hot spots are capitalizing on the boom market in Wi-Fi-enabled notebook and handheld computers. Gemma Paulo, an analyst at In-Stat/MDR in Scottsdale, Ariz., estimates that shipments of notebooks equipped with industry-standard 802.11b chips or cards—which offer a raw data rate of 11Mbit/sec. at a range of 100 feet indoors and 300 feet outdoors—will hit 16 million this year. Free Wi-Fi is an alternative to paid services offered by companies such as Starbucks Corp., which, in partnership with T-Mobile USA, currently offers Wi-Fi service at rates ranging from $9.99 per day to $29.99 per month in 2,300 of its coffee shops. Lovina McMurchy, director of Starbucks Interactive, says the paid Wi-Fi service helps attract customers after peak morning hours. And those who use it tend to be "high-income customers" who "come more often and stay longer," she says. She declined to reveal the service's impact on the company's bottom line. John Wooley, chairman, CEO and president of restaurant chain Schlotzsky's Inc. in Austin, isn't so shy in sharing details of what he calls the "strong ROI" from the company's free Wi-Fi service. Schlotzsky's currently offers free Wi-Fi in 30 of its 600 company-owned or franchised Schlotzsky's Delis. Wooley says he figures that the free Wi-Fi results in an additional 15,000 visits per restaurant per year by customers who spend an average of $7 per visit. Wooley also uses the free Wi-Fi service as a high-tech marketing tool. When wireless users first connect to the Schlotzsky's Wi-Fi network, they're shunted to an in-house "splash" Web page that the chain uses to promote itself and its bill of fare. Schlotzsky's has even bought high-gain Wi-Fi antennas that transmit the splash page as far outside its restaurants as possible, Wooley says. One Austin outlet beams its signal into dorm rooms at the University of Texas, and another beams it into a competing Starbucks. This high-tech guerrilla marketing campaign to grab the eyeballs of potential customers is less expensive and potentially more targeted than buying a 30-second TV commercial, Wooley says. Panera Bread Co., based in Richmond Heights, Mo., has also embraced free Wi-Fi as a marketing tool and plans to offer the service in 130 of its 600 bakery cafes by year's end, eventually extending the service chainwide. Ron Shaich, the company's chairman and CEO, says he views free Wi-Fi as an amenity that has already started to attract and retain customers at what he calls a "minimal cost." In fact, Shaich considers free Wi-Fi to be such an essential marketing tool that he dismisses any discussion of ROI. "What is the ROI on a bathroom?" asked Shaich, pointing out that the day of pay restrooms in restaurants has long since passed. Keith Pierce, president and CEO of Parsippany, N.J.-based Wingate Inns International Inc. says he has enlisted free Wi-Fi as his newest weapon in a technology arms race to attract budget-minded business travelers. Pierce says Wingate, a division of travel conglomerate Cendant Corp., started offering free wired Internet access four years ago as part of an all-inclusive room rate that also included free local phone calls and free use of on-premises business centers. Now that competitors have started to offer free wired Internet service, Pierce has raised the ante by rolling out free Wi-Fi throughout the chain, with all 100-plus properties expected to offer the service by the start of next year. Pierce says he didn't even consider paid Wi-Fi service, saying his research shows that going the paid route isn't worth the effort. Under the paid model, Pierce calculated that a typical property would have roughly two paid Wi-Fi users a day. After splitting the revenue with a Wi-Fi operator, Pierce says this would return only about $7.50 a day to the franchisee. Wingate has outsourced deployment and operation of its free Wi-Fi service to LodgeNet Entertainment Corp. in Sioux Falls, S.D., the company that also provides Wingate with in-room pay movies and video games. Apple Core Hotels Inc., a New York-based operator of six budget hotels in mid-Manhattan that cater to business travelers, knew it needed to offer free Internet access for competitive reasons, says Vijay Dandapani, the company's chief operating officer. Dandapani says Apple Core chose Wi-Fi instead of Ethernet because it was far easier and cheaper to install in the company's hotels, which are rehabilitated buildings that are all at least 100 years old. Installing Ethernet connections would have required drilling into walls and "making a mess" of wallpaper and carpet, Dandapani says. Installation of the Wi-Fi service went quickly, he adds, taking about six weeks per property. Installation was a learning process, Dandapani says. Buildings with high ceilings, which allow for better propagation of the Wi-Fi signal, required only two access points per floor. Buildings with lower ceilings—and worse signal propagation—required four access points per floor. Beachfront Hawaii might be the last place you'd expect to find a Wi-Fi hot spot, but Waimea Plantation Cottages on the island of Kauai operates what's probably the westernmost Wi-Fi service the U.S., free or paid. It's five miles from the end of a dead-end road on Kauai's western shore. Liz Hahn, a spokeswoman for Kikiaoloa Land Co. in Waimea, Hawaii, which operates the cottages, says the company decided to offer free Wi-Fi as a perk to guests to enhance their vacation experience. "People can get up in the morning, check their e-mail and then spend the rest of day relaxing," Hahn says. Customer service and satisfaction at a relatively low capital cost means that free Wi-Fi will continue to proliferate at the expense of the paid model, according to Schlotzsky's Wooley. "I think pay Wi-Fi is going to go away," he says. Panera's Shaich agrees, saying hotel and restaurant customers will eventually come to expect free Wi-Fi access. Dan Lowden, the vice president of marketing at Wayport Inc., a Wi-Fi network company that offers paid service at 545 hotels and 12 airports, at rates that range from $6.95 for a single connection to $29.95 a month, contends that the paid and free models will coexist. Paid networks offer higher-quality service with better hardware and carrier-grade networks, Lowden says. He adds that Wayport offers its paid service in locations untouched by free Wi-Fi providers, such as major airports. Maybe not for long, though. Wooley says he has his eye on offering free Wi-Fi in airports. Craig Mathias, an analyst at Farpoint Group in Ashland, Mass., predicts that free and paid Wi-Fi will coexist for the next five to 10 years. But he says the paid model will eventually prevail, as cellular carriers add Wi-Fi service to their portfolios and dominate the market. 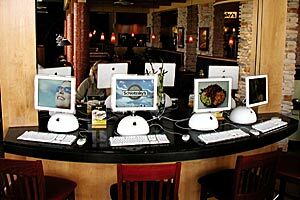 Schlotzsky's customers can use their own laptops (top) or the restaurant's computers to surf the Internet for free. This "splash screen" greets users of Schlotzsky's free Wi-Fi service.